A few weeks ago I was working with some beautiful grapefruit (remember that homemade beeswax lip balm that I flavored grapefruit?! So great.) So I put a picture of the grapefruit I used on Instagram and asked how people liked their grapefruit best. I was shocked at how many people had never eaten it! Someone mentioned they liked it broiled and that caught my interest. 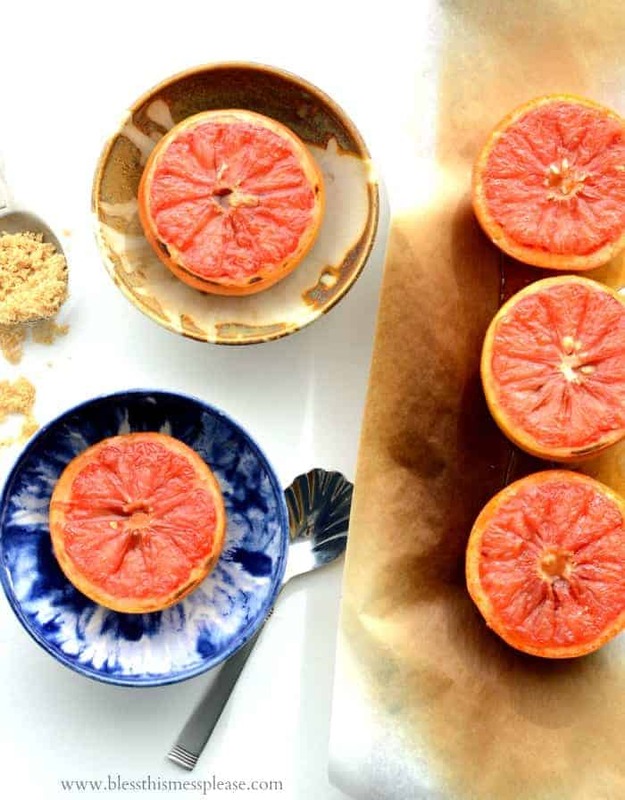 After a little research I now have a lovely broiled grapefruit recipe to share with you today. It’s also the first #eatseasonal post of the year! 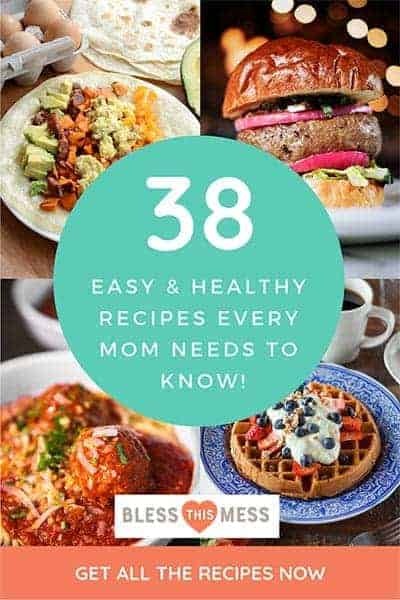 So check out the end of the post for all kinds of amazing recipes from some of my favorite bloggers. 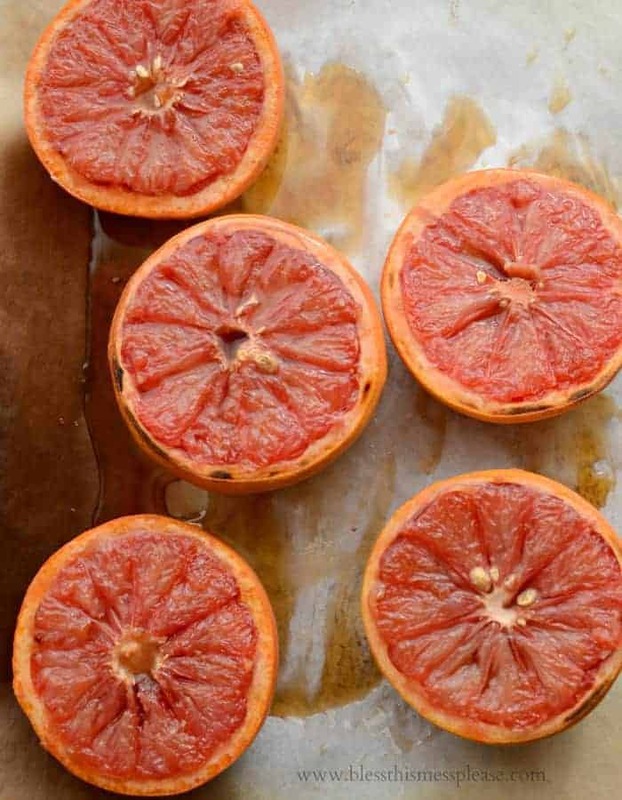 Broiled grapefruit is essentially cut and segmented grapefruit that you add a little sugar too and broil it. The broiling caramelizes the sugar, warms the grapefruit, and brings out some of the natural juices and sweetness in the grapefruit. It is delicious! I really like grapefruit and don’t have to broil it to enjoy it in the morning, but the broiled grapefruit would be a really pretty (and a little fancy) addition to a brunch or breakfast date. Try it, you’ll love it. There were lots of different broiled grapefruit recipes out there. Some used things like butter and spices and I just couldn’t get on board. In the end I settled for just lovely brown sugar to broil on top. I tried and wanted to use honey but I couldn’t get it to do much besides burn. It was a fun natural idea but it just didn’t work for me. I was surprised at how much of the sugar kind of melted right off and into my pan. I think you end up eating a lot less of the sugar than you actually put on the grapefruit. The sugar does help to draw the juices out of the grapefruit though which then caramelize a bit. This is a fun twist on a simple breakfast stable and I think you’ll love it. 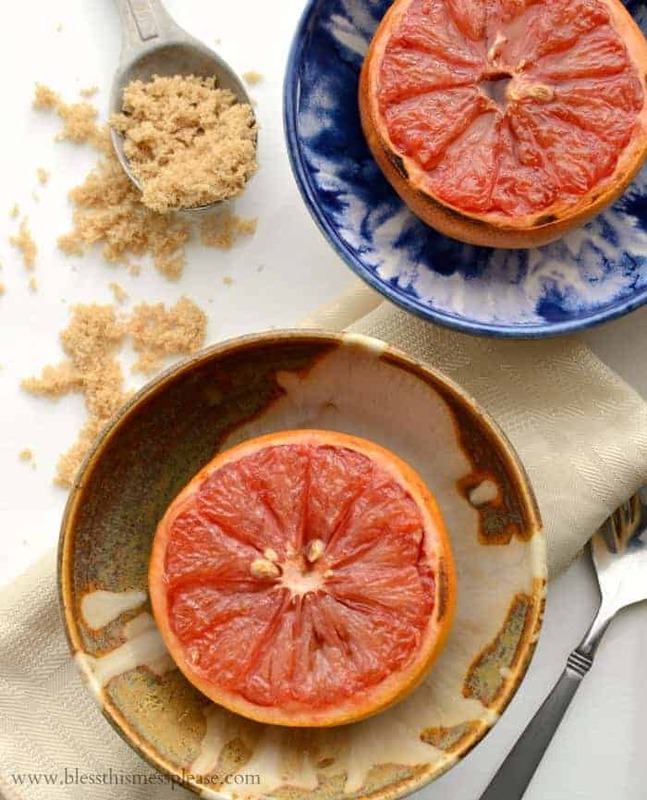 Broiled Grapefruit are a quick and easy way to enjoy grapefruit. Line a baking sheet with foil or parchment paper for easy clean up. Slice the grapefruit in half. Use a sharp paring knife to around the outer edge of the grapefruit to loosen the pieces from the skin and pith. Use a sharp paring to cut in between each segment. Place two teaspoons of brown sugar on each grapefruit half. Use the back of a spoon to spread the sugar evenly over the entire top of the grapefruit. Move your oven rack to a high position so that when the grapefruit are in the oven the tops of the grapefruit are just a few inches from the heating element. Place the grapefruit in the oven and broil on high for 3-5 minutes until the sugar starts to bubble and caramelize. Be close attention to the broiling so that you don’t burn the sugar on top. The key to eating grapefruit is knowing how to cut it. For Christmas breakfast we would have halved grapefruit to eat and my grandpa was always in charge of cutting them. I learned from him and my mom (who also loves grapefruit) how to cut them. You slice the fruit in half so that the segments are sliced in half. Then you use a sharp paring knife to cut around the edge of the grapefruit. You are cutting in between the fruit flesh and the white pith (just inside the peel) to loosen the fruit flesh from the pith. Then do you see the little white lines running to the center of the cut grapefruit? You need to run your sharp paring knife along both sides of that little white skin. You are essentially cutting each segment out into the shape of a triangle. This is a little tedious but when you go to eat it with a spoon the pieces will come right out. If you aren’t going to broil them, just cut the grapefruit the same way and enjoy them with a spoon. I like to eat all of my grapefruit and then squeeze the now empty half of grapefruit really hard into the bowl I was using. A bunch of juice is still in there! I then drink the rest of the grapefruit juice out of the bowl. Delicious! I hope this encourages you to try this fruit. I like pink grapefruit the best and they are perfect this time of year because they are in season. There’s no better time for your first taste! Here’s a little diagram of where you should be cutting your grapefruit. It’s not perfect but I hope it will help the visual learners. Want to know what else is in season right now? 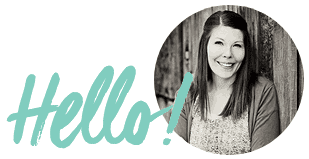 Check out Becky’s (from the Vintage Mixer) January produce guide. I LOVE this guide (and it makes a beautiful desktop background)! These are things that will taste awesome and will probably be on sale too. Eating what’s in season is always a great idea. 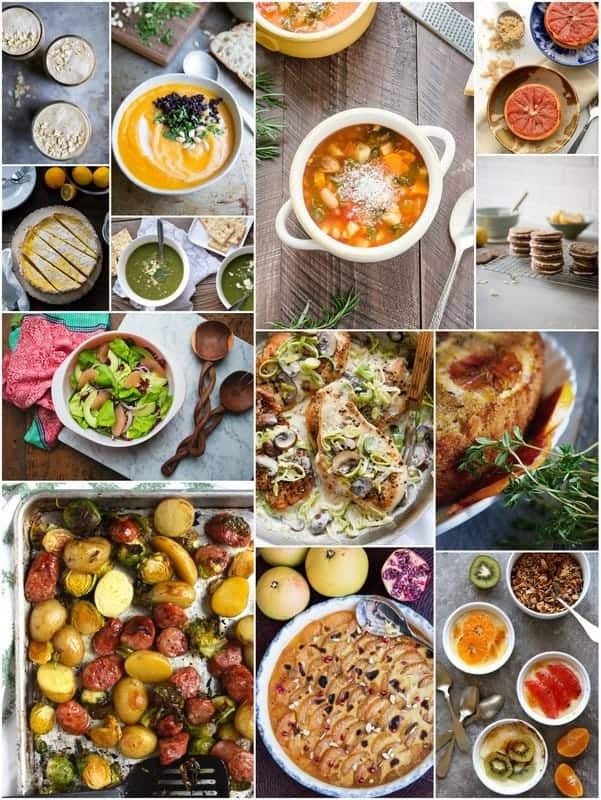 Now enjoy some seasonal, beautiful, and delicious recipes from some of my blogging friends. Don’t they look awesome! Which one do you think you’ll be making this week? Those lemon filled gingersnaps are looking mighty delicious to me today! Enjoy! I love broiled grapefruit too! Sometimes I top mine with some maple syrup 🙂 I especially love that you segment yours before broiling it… why have I not thought of that?! This is my favorite way to enjoy grapefruit in the winter. Gorgeous photos, friend!!! I learned to make this in Home Ec with the sugar and a cherry on top to. However several years ago someone told me to put a little salt on grapefruit and that would take away the tart taste. Not a lot of salt just a sprinkle or two. Now I never put sugar on it. Also, a fruit supplier told me to put a little lime juice on Honeydew melons and that would make the taste sweeter. I did and now I have to have the lime juice on Honeydew’s. We had a set of grapefruit spoons with serrated tips to help release the segments out of the pith. My Mom always served grapefruit this way…. Just lovely! The broiling turns the grapefruit such a bright and vibrant color…. I am going to need to go stock up on my citrus. Broiled grapefruit? Ewwww! Broiled sugar? Slurp! Either I had an amazing grapefruit or with 1t of rock hard brown sugar, this made an amazing grapefruit! I am so doing this again and again…..thanks!!! PS… I ate the other half of the grapefruit yesterday without broiling it. I am now a broiled grapefruit convert….the taste wasn’t even comparable! I love grapefruit any way I can get it, and this is perfect for a sweet treat or guests. 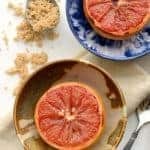 I love grapefruit and typically eat it as it, but this looks like great way to change things up and satiate that sugar craving.